► Can it convince coupe-SUV haters? BMW will not be deflected from its coupe-SUV course, though we’re still not entirely sure what that is. Having created the divisive sector with the, um, ‘ rather characterful’ X6 in 2008, its smaller, X3-based X4 was launched in 2014 before any of its rivals had even joined the party. Even at the time of writing, only Mercedes has gone down the same route, with its X4-rivalling GLC Coupe and X6-analogue GLE Coupe models. Nearly all variants of the X4 will have four-cylinder turbocharged engines, eight-speed Steptronic automatic ‘boxes and a reworked xDrive four-wheel-drive system, but there’s a solitary six-pot in the range and it’s coming to the UK: furthermore, it’s the sole M Performance derivative (for now…), badged the M40d. Packing a twin-turbo 3.0-litre diesel, it delivers 322bhp with a colossal 502lb ft backing it up, which results in one seriously quick SUV. What's the difference between this and the X3? Hardly much. BMW says it has taken the M Sport suspension of the X4’s closely-related third-gen X3 stablemate and then tweaked it to accommodate the coupe model’s lower ride height and sportier intent. Further, its centre-of-gravity is lower than the X3’s, it has a 30mm wider rear track than the old X4’s, there’s an M Sport differential on the trailing axle and lightweight construction techniques shave up to 50kg from the X4’s mass. Moving inside, BMW has made the X4 slightly larger in all the dimensions that matter, with an additional 54mm in the wheelbase resulting in 27mm of extra legroom for those seated in the rear. The 525-litre boot is also useful and it’s accessed by an electrically-powered tailgate as standard, while the rear seats split 40:20:40 to maintain as much SUV practicality as that sloping roofline will allow. And the looks? Well… we kind of like them. 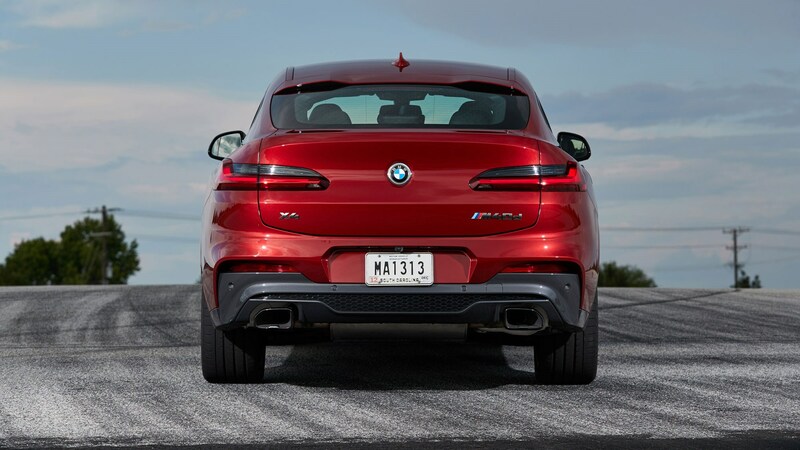 Only the most fervent coupe-SUV haters could argue the X4 is actually ugly, while there’s a real appeal to the smoothed-off rear end of the BMW. Obviously, M Performance 21-inch alloys, the beefed-up bodywork and the lustrous Flamenco Red metallic paint help, but we’re inclined to say this is the most handsome coupe-SUV we’ve yet seen. In addition to the engines already mentioned, an M40i with a 3.0-litre turbocharged straight-six petrol – delivering 355bhp and 369lb ft – is on the way later this year. However, there’s no reason to overlook the M40d, because it’s a superb performance SUV, which blends together a deft chassis, a thumping drivetrain and a veneer of top-level civility. It’s not without faults; the ride on the 21-inch wheels, with the adaptive dampers in Comfort, is occasionally on the lumpier side of smooth and the steering is needlessly heavy in Sport and Sport+ modes, while the engine doesn’t like to rev – no turbodiesel does, but if you’ve sampled an X4 M40i, the derv-burner’s reluctance to spin up will frustrate you. However, the steering, in general, is utterly faithful and super-precise. 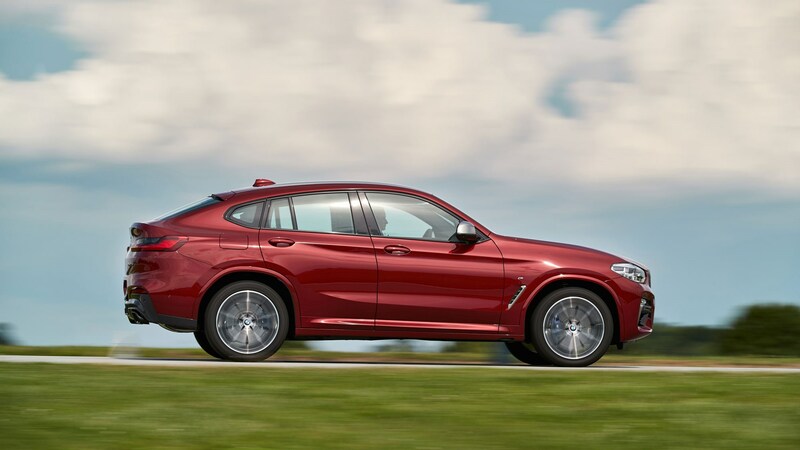 Body roll is remarkably quelled and – if you turn off all the electronic traction aids – the rear-biased xDrive and the M diff will allow you to punch the X4 into mild oversteer on the exit of tighter bends. Not tyre-smoking drifts, mind, just a serene amount of slip with a tiny snifter of correctional opposite lock. Wonderful. Driven more sedately, you can appreciate the SUV’s slippery aerodynamic properties, as they help contribute to a cabin that is eminently hushed. With lower revs on the dial, you’ll be hard-pressed to hear anything from the engine and so it’s left to the tyres to aurally keep you informed of the BMW’s forward momentum. The BMW X4 M40d is a prime example of ‘have your cake and eat it’. It’s fast but frugal, practical yet aesthetically stylish to these eyes (though not many on the CAR magazine team agree) – and, sometimes, trying to cram a load of conflicting characteristics into one product can lead to a severely compromised result. But to drive the new X4 is to understand it. 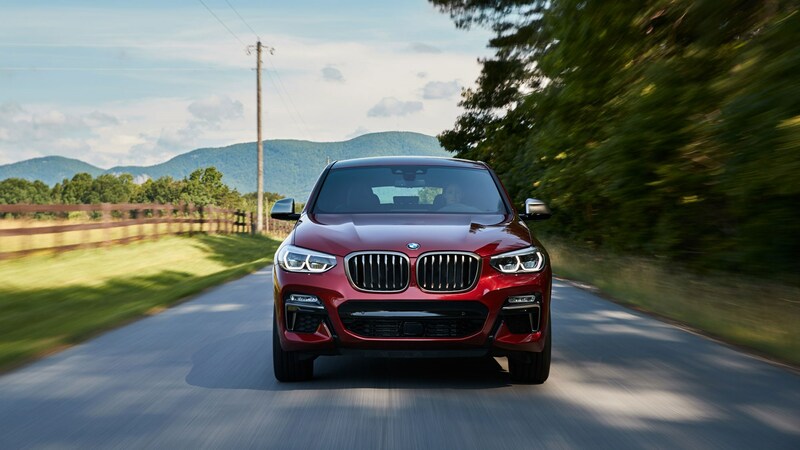 As SUVs go, no matter what their exterior shape, this BMW is one of the most rewarding to steer.